Over 100 civilians were hospitalized, including dozens of women and children, after anti-Assad militants unleashed a wave of mortars filled with poison gas on government controlled Aleppo Saturday evening. 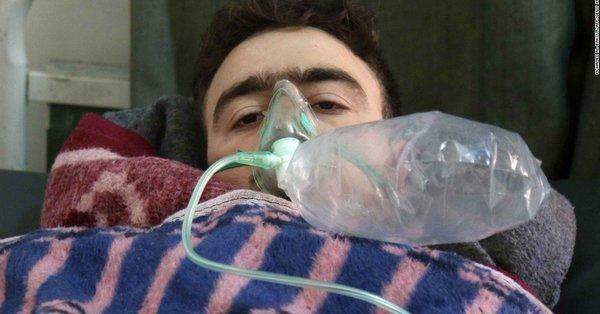 Syrian state-run SANA published multiple photos and video of victims in the city's hospitals being treated for what's reported to be chlorine gas exposure. Though it's not the first time that 'rebels' seeking to topple the Assad government have conducted a chemical attack on pro-government areas according to United Nations findings, it is the first time that mainstream American outlets like CNN and Reuters have featured coverage of such events. In total official Syrian government sources reported 107 people were injured, a sizable portion of them children, after al-Qaeda terrorists linked to the Hayat Tahrir al-Sham alliance (HTS, the main al-Qaeda group that controls Idlib) attacked three Aleppo districts with poison filled projectiles. Initially the death toll approached 12 according to early reports, however, it now appears there were no fatalities resulting from gas exposure, though many remain in the hospital in what international reports say is the highest casualty toll since the Syrian Army liberated Aleppo two years ago. “The explosive (shells) contain toxic gases that led to choking among civilians,” Aleppo police chief Issam al-Shilli told SANA. Western backed "rebels" have targeted residential areas in Aleppo with chlorine gas! Dozens of civilians and children suffocated and were taken to nearby hospitals. Russian jets quickly began pounding HTS positions — the group military officials said was responsible for the attack — in retaliation. The Russian foreign ministry has called on the international community to definitely condemn the attacks carried out by opposition armed groups. Ironically a Syrian and Russian joint offensive to liberate Idlib from HTS was delayed in September after the United States threatened military action over what western intelligence agencies claimed were preparations by Assad's forces to unleash a chemical attack. However, with what now appears a large-scale attempt by the western-backed armed groups to gas civilians in government areas, it will be interesting to see if there's any condemnation whatsoever from Washington, London, or Paris.